Visit the RMC Boeckeler website for full product listings and downloads, including videos, photos and publications. PowerTome XL PowerDrive cutting stroke for large blocks and hard materials. Overhead LED array for epi-iillumination, LED backlight for approach of the knife to the specimen, and LED transillumination spotlight. High stability mechanical advance system. Dual footswitch control with trim function. PowerTome PC Hybrid control system with touch-screen monitor and digital tactile controller. High definition video monitoring system with built-in measuring capability. Record and save video clips and still images. Built-in report generator, database and diagnostic routines. High stability mechanical advance system. 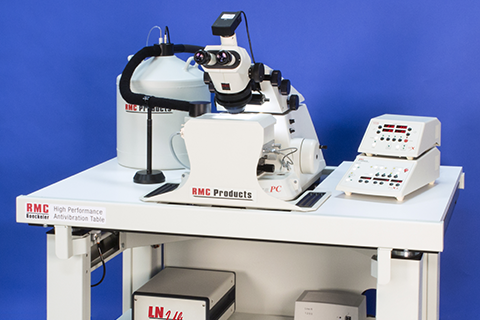 LN Ultra Cryosectioning system for ultramicrotomy of biological and material science applications. Advanced design cryochamber, ultra stable, +35° C to -180° C. Multiple knife holders for glass and diamond knives and trimming tools. 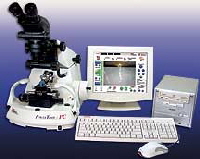 ATUMtome Automatic tape collecting ultramicrotome for array tomography, 3-D reconstruction and correlative workflow. 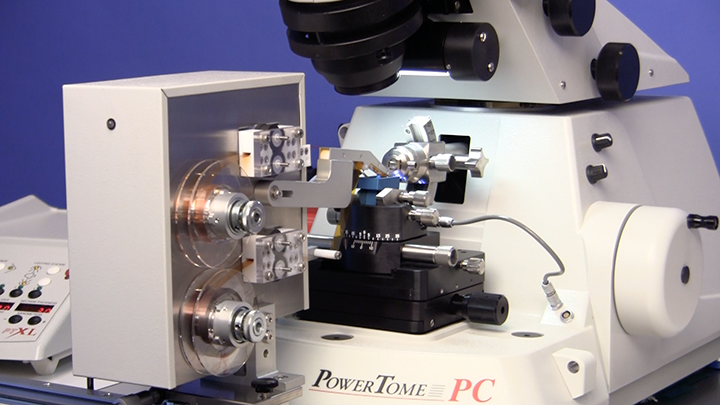 Collect hundreds to thousands of sections onto a tape substrate for later analysis and SEM imaging. strips. Digital readout of applied load for consistent and controlled breaking. Produces knives from glass up to 12 mm thick. HPM 010 High Pressure Freezing Machine Over 100 installations worldwide and more than 400 scientific publications. 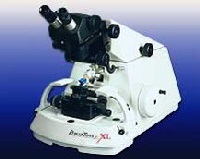 Well-frozen specimens up to 200 µm in thickness and 2 mm in diameter. Excellent results with biological tissues and suspensions. Closed system excludes air for reproducible staining and operator safety. Low operating cost. Individual staining procedures are easily programmed. Stain multiple grids using precisely the same times and reagents. 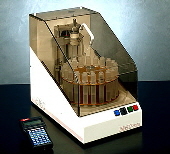 Carousel processor with 20 reagent vial stations. Sealed vials for operator protection and to control evaporation of solvents. Fifty programs can be stored in memory, each program with up to 55 steps. Program key for safe and secure operation. High capacity with up to 48 specimens in multi-compartment baskets.